It is very sad to report that David Hossack died on 8th December following a severe stroke from which he was unable to recover and our condolences go to his wife Hilary and family Jon and Joanna. 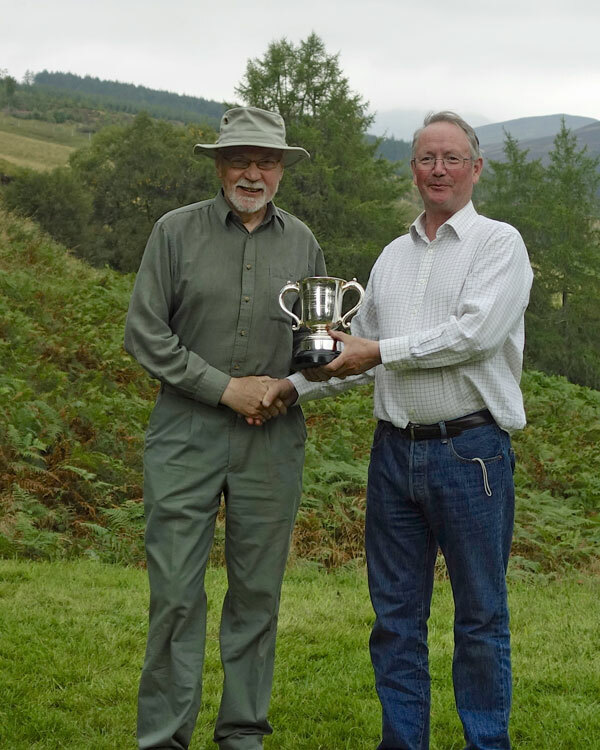 David did an enormous amount over many years for fullbore shooting in general and for Scottish shooting in particular. During his time as Captain of the Scotland team he was instrumental in raising the standard of shooting and was very successful in achieving the best results from the teams, particularly in the overseas teams he took to Australia and the West Indies. His personality and positive approach to leadership made a big difference in helping team members to achieve their personal best results. His own shooting was of a very high standard and he was in the Scotland team for the 1974 Commonwealth Games in New Zealand. 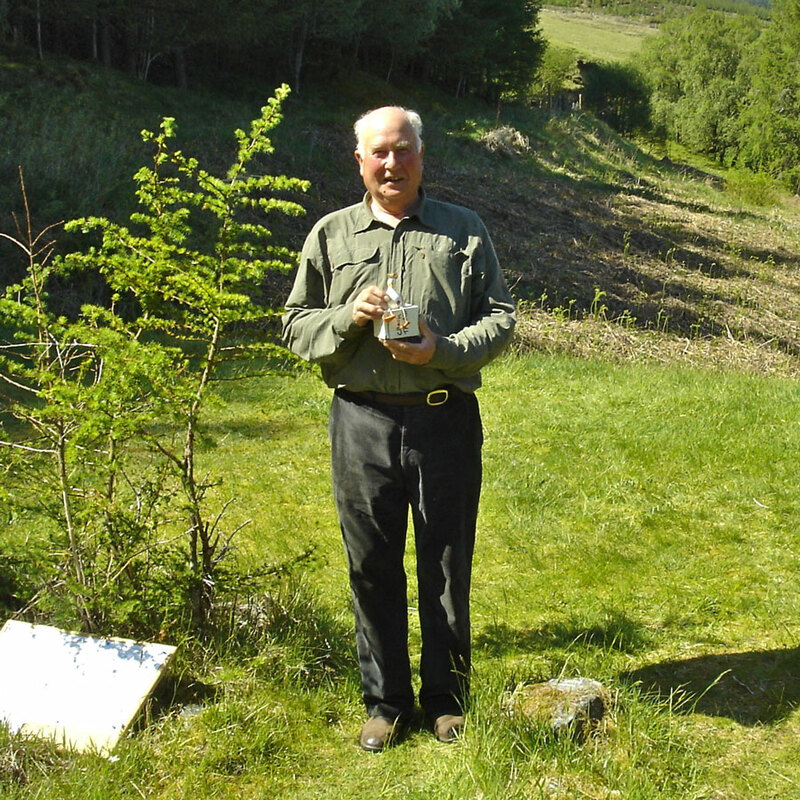 He had the distinction of being in the winning Scotland team for the National Match in 1965 and then in the next winning team in 2010 -- a gap of 45 years. He also shot in Great Britain overseas teams and made regular appearances in the top 100 of the Queens Prize and he was especially proud when his daughter Joanna won the Queens Prize in 2000. 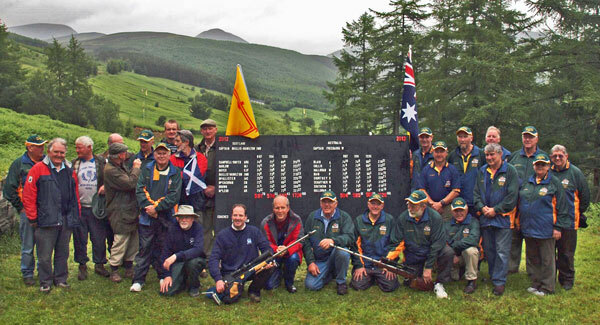 In recent years David took up Match Rifle shooting and quickly established himself in the Scotland teams that won the Elcho Match in 2010 and 2011. 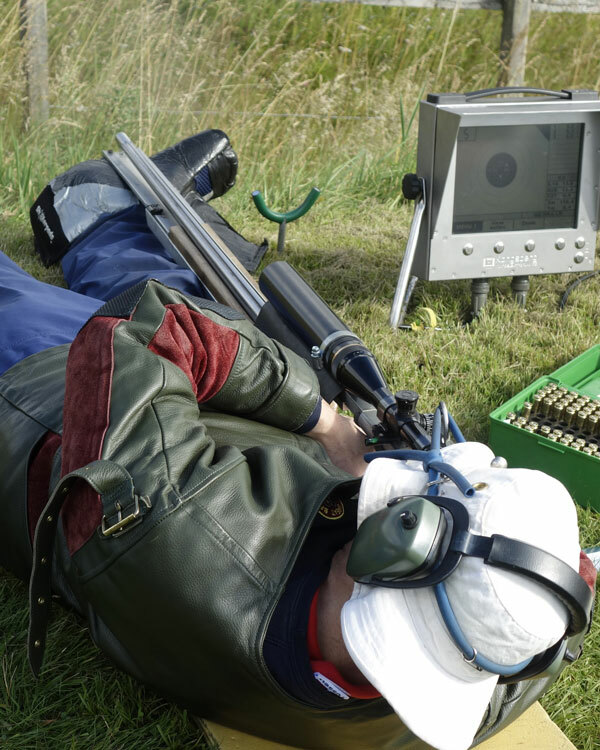 David also helped in running the NSC at Bisley during a difficult financial period when the future of the NRA was in doubt and he also helped the North London Rifle Club at Bisley including his time as Chairman of the club. His contribution to fullbore shooting was enormous and he will be sorely missed by all that knew him. Despite a couple of late call-offs seven Scots competed in the final autumn open meeting of 2012 - that of the combined English and Irish clubs. Overall Nick Tremlett won by a single point from Rob Lygoe. Martin Brown was high Scot in 4th place largely due to a 21 bull start on the Sunday "before the hangover wore off" as he put it. The up and coming Mark Crichton Maitland was also well up in 9th place. Full results are available on the English VIII website. Makes you think - looks a hard way to do it! 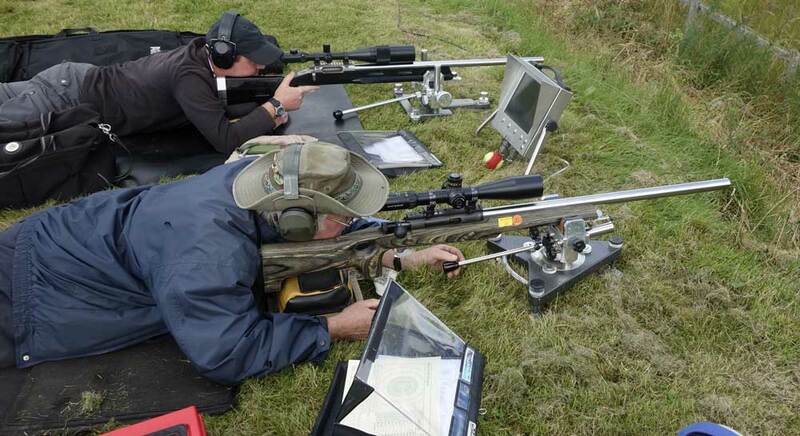 The Autumn meeting of the NRC of S at Blair saw a good turnout from both the home team and visitors including some first timers intrigued by the reputation of the range. They were not to be disappointed. 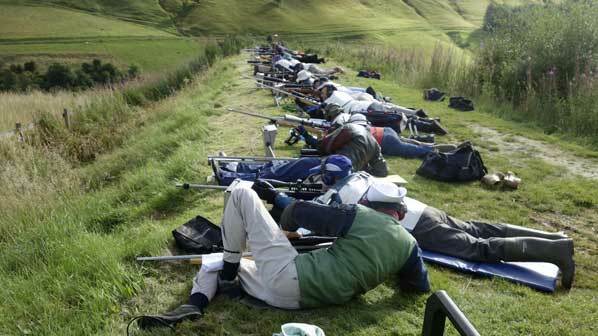 Saturday dawned bright and calm, 29 firers took advantage of the relatively benign conditions to run up some impressive scores, none more so than Mike Baillie-Hamilton, with a 100, 99 and 98 at 987, 1114 and 1233 yards respectively, putting him an unstoppable 12 points ahead of the rest of the field, with Mike Barlow second and Alex Cargill Thompson third. 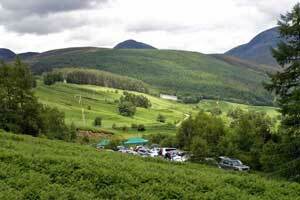 Blair looked its loveliest, although gradually the clouds grew, the wind dropped and the midges came out in force to chase the firers off the hill. Sunday looked to be similar although with the wind blowing up the glen from the south the conditions at 1114 yards were a little more testing. However at 1233 yards the resident demon of Glen Tilt came out to sort the men from the boys and wreaked especial havoc in the first detail. 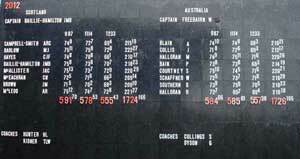 Only the Captain broke 95, and only six others, old Atholl hands all, broke 90. The totally unpredictable wind twisted and turned through zero and the flags achieved a highest possible score for mendacity. At the end of the day, Mike Baillie-Hamilton claimed (including a record score by 6 points) all the available silverware, the Maxwell Cup, the Sandeman Trophy and the Brodie Trophy. The Brown tankard went to Alex Cargill Thompson and the Maitland Cup for the highest scoring tyro went to Jim Brown. The F' Class salver went to Peter Hunt. In the Grand Aggregate Mike Barlow with 475.46 came second to his Captain (489.51), with Alex Cargill Thompson third with 469.33 and Si Whitby fourth with 461.28. Click on the 1080p HD video above for of one of the competitors at the Autumn Meeting using the back position. 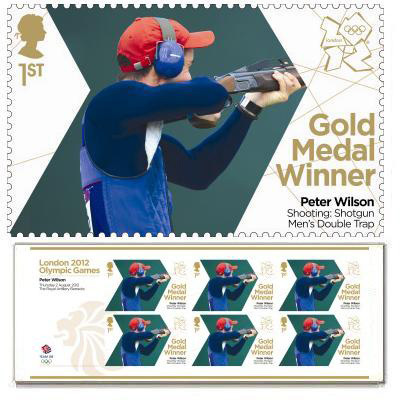 There are now special Royal Mail postage stamps available to recognise Peter Wilson the Gold Medal Winner of Shooting: Shotgun Men's Double Trap (and 28 other stamps featuring the other winners). May struggle to find packing space on the way home to Scotland! The 150th staging of the match was always going to be a special one and having the Earl of Wemyss and March and Lord Elcho attending provided added incentive for us to try to extend our run of three wins into previously uncharted waters. At 1000x we opened up a useful lead of 5 points over Wales and, perhaps of greater interest, 9 points over England who had a one shot mishap. At 1100x in trickier conditions we shed a few points losing three to England but drawing clear of Wales and Ireland. 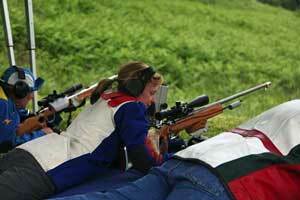 After 1100x the MLAGB laid on a demonstration of muzzle loading using rifles from the early days of the match. In blatant breech of the match rules but with the agreement of the umpire both the English and Scottish captains fired with these rifles and made hits. Lord Elcho was also invited to shoot and showed he must have marksmanship in his blood by scoring a bull at this range - 100x further than the original matches were held. And so we retired to the decisive 1200x stage with a slender lead of only 6 points. The weather forecast was for a band of thunderous rain to strike midway through the shoot and so we made a tactical decision to try and shoot fast before it arrived. 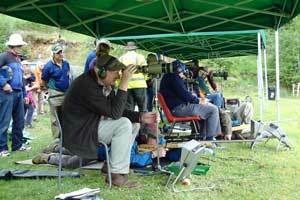 The conditions were though difficult and we averaged only 67s for our first six firers. 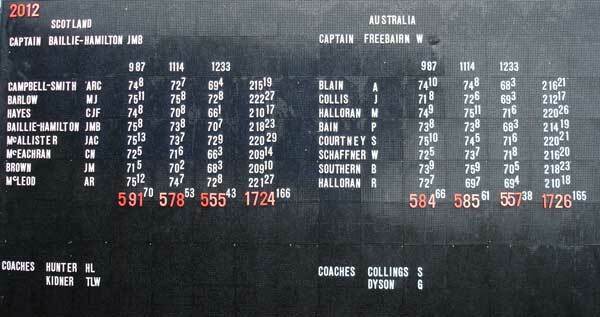 England had taken a different tack and after much waiting had only two similar scores on their board. Then the rain arrived in torrents. Everyone retired to their cars and the match was suspended for ten minutes. The storm blew over scoreboards and soaked anyone out in the open but, sadly for us, was over sooner than forecast and was replaced with more benign weather. Had we thus handed the English the perfect chance to catch us? Despite this probability our last pair, Angus McLeod and your captain, emerged from shelter and shot 74 and 73 which was more than any of the English could do. Both finished with strings of bulls whilst the English last pair, including their captain, each finished with an inner. These last two shots proved crucial as we won by two points but with an inferior V-bull count. Pheww! Thus it was that Lord Elcho had the opportunity to hand over the gold winners medals to his fellow countrymen. The Australians had also shot alongside in the concurrent Match Rifle Overseas Teams Match achieving 4th place ahead of Ireland whilst we won ahead of England and Wales. 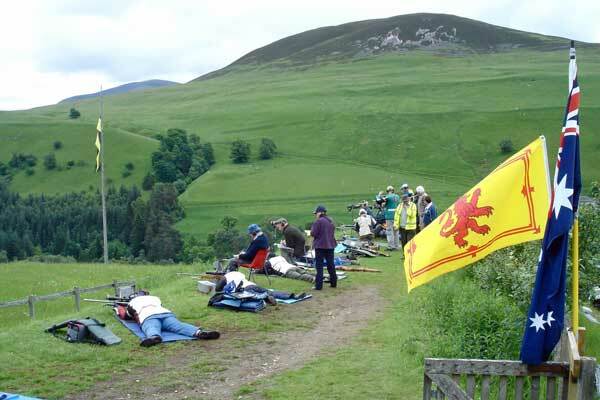 The shooting was followed by a commemorative dinner in the NRA Pavilion at which Colin Hayes and Lord Wemyss gave the two speeches to round off a very Scottish day. It was a pleasure to be joined for dinner by many previous participants in the Elcho. Incidentally the NRA results are wrong yet again as our main coaches were once again Alex Henderson and Hamish Hunter guided by Hugh Butcher. 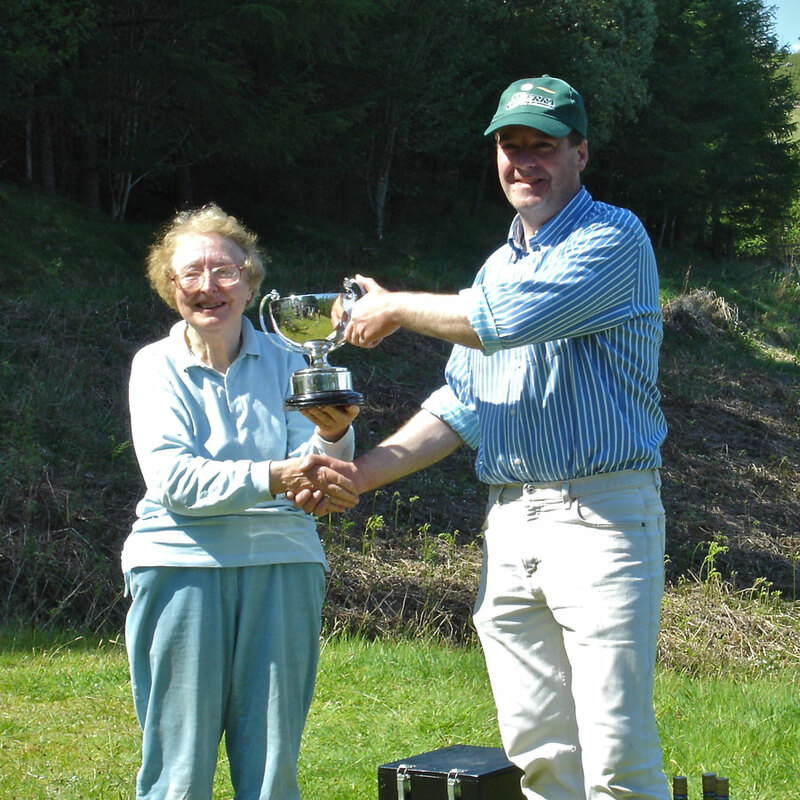 Our top scorer was Angus McLeod to whom Frances Packman was able to present the Copland Cup. 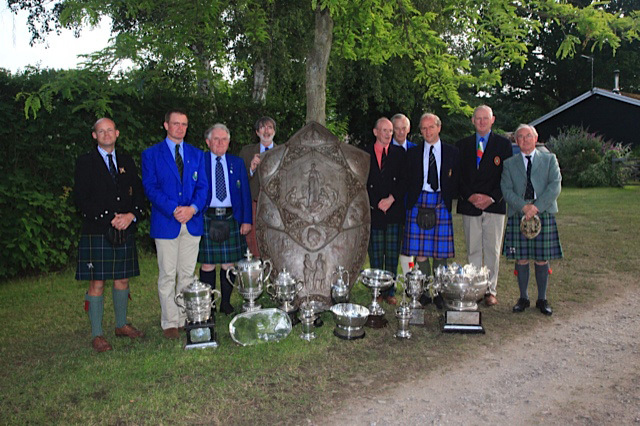 The Scots won 11 of the 16 trophies available to us at this year's Meeting – plus the Elcho of course and we made up half of the GB team in the Woomera match. 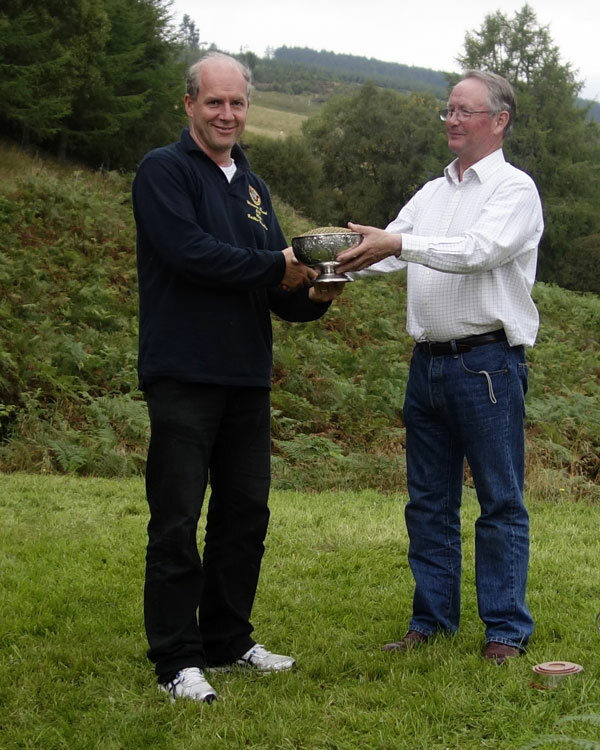 Mark Haszlakiewicz retained the Cambridge Cup at the meeting of the Cambridge Long Range Rifle Club over Friday and Saturday with a total of 440 (219+221). The Spring Meeting 2012 will be remembered for the perfect warm sunny weather throughout the two days. 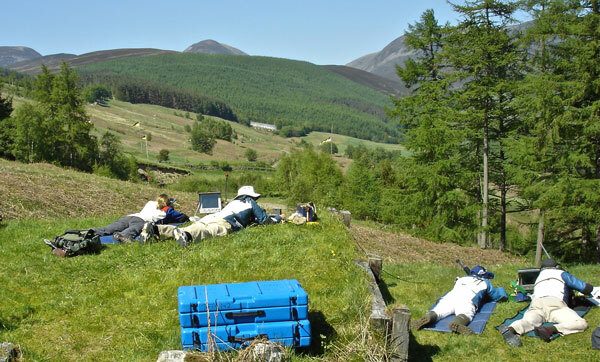 Indeed, it was very hot, and there were no midges. Winds were generally light, tending to blow from the left on Saturday, and from the right on Sunday. As always at Blair, there was much disagreement between wind flags and the visible mirage, and strange elevation effects were experienced, particularly on Sunday, on the right hand side of the range. Further discomforts were experienced by the Scottish Elcho captain whose telescope was found to be departing from his rifle at an early stage. The star performer throughout both days was Mike Barlow. On Saturday, with 285v32, he led Mike Baillie-Hamilton by 5v10, with Allan Campbell-Smith third with 273v16. On Sunday, Mike Barlow, with 214v24, beat off a determined attempt from Tim Kidner by 2v07 points, with Hamish Hunter on 211v10. Overall, Mike Barlow finished with 499v56 to take the Crawford Cup, against Mike Baillie-Hamilton with 490v04 and Colin Hayes on 480v24. 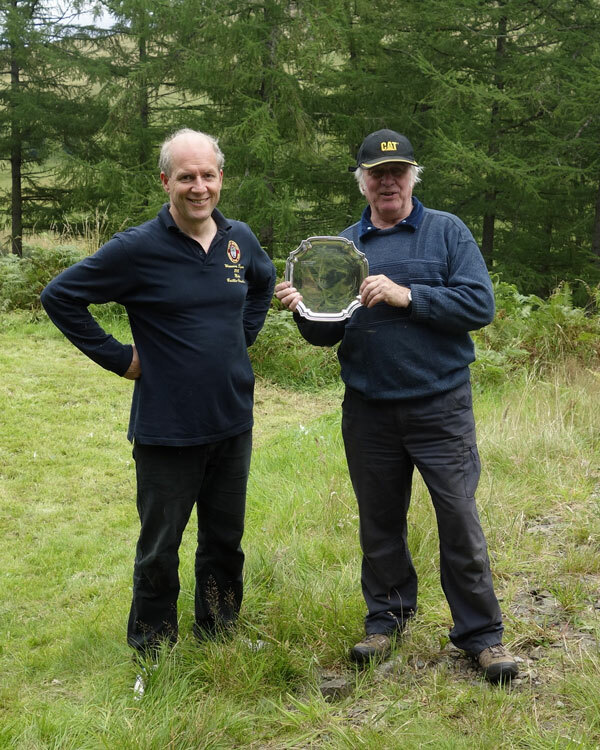 Colin had a fine 1200 yard aggregate result with 157v05 – 6v07 behind Mike Barlow - and Jim Brown took the tyro prize with 453v27. 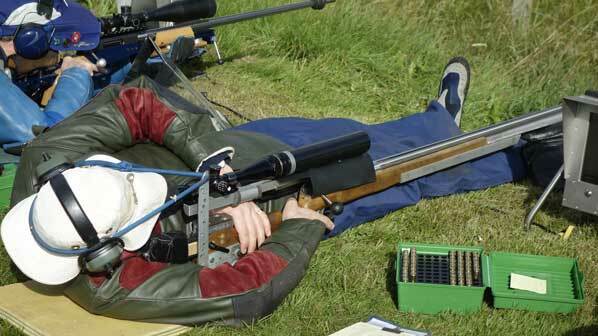 Des Parr had a fine F Class shoot with 499v47, but lacked competition in his discipline. However, Mike Barlow provided opposition and was just ahead on aggregate by nine vee bulls. This was a beautiful weekend’s shooting – very difficult and with much separation of scores. Our thanks go to Tim Kidner for his smooth organisation, and to the operational support from Des Parr and his team of helpers. 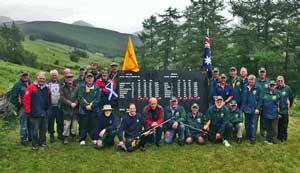 A good turnout of eleven Scots attended the first of the year’s major shoots. Turnout was somewhat greater than in recent years, possibly influenced by the Woomera squad practice on the preceding day. Conditions were fine with some interesting winds, particularly on Sunday. But good conditions for evaluating the experimentation with new bullets and powders which appeared widespread. On Saturday a chill headwind, angling, deceptively took the edge off scores, only two possibles being recorded at 1000 yards. Overall leader by two points was A Gent on 217. Leading Scot was Jim McAllister on 214. It was perhaps the general atmosphere of innovation which prompted the English Eight Club to introduce a novel diversion in the form of a helicopter descent into the Danger Area during the final part of Saturday’s shooting. This, (actually a misguided response by police and air ambulance to an incident just outside the DA), resulted in the loss of most of the final 1200 yards detail. As a consequence the evening was enlivened by energetic debate around what to do about the missing scores. On the English side it was decided that for those who had been unable to finish their shoot (barely started in some cases) Sunday’s 1200 stage scores would be doubled for the missing shots. However the consensus among Scots was that, particularly if Sunday’s conditions were significantly different, this could result in trophies being won on the strength of ‘imaginary’ shots. Better to discount the whole of the unfinished 1200 stage and award the Scottish trophies on the five properly completed ranges, although this would mean discounting some excellent scores made by competitors in the earlier 1200 details. On Sunday conditions were indeed quite different. The initial dead calm soon progressing to a brisk South-Westerly with sudden large variations in strength, some in excess of five minutes, and almost impossible to read accurately. Few broke 70 at 1100 and only one, Colin Hayes, at 1200 with a magnificent 71, to win our Ranken Cup for the truncated 1200 Aggregate. 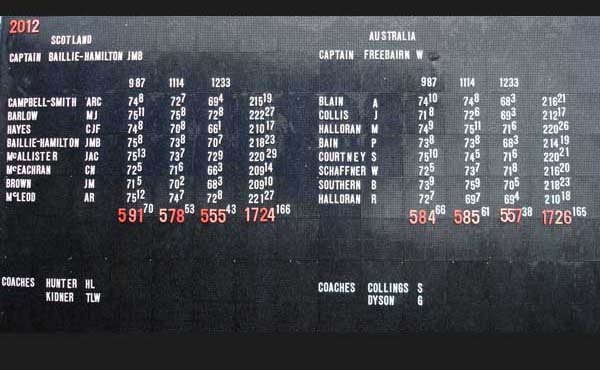 Notably, adding this score to an excellent 69 made on the previous day, produces a total which would have been a winning one by English reckoning too. 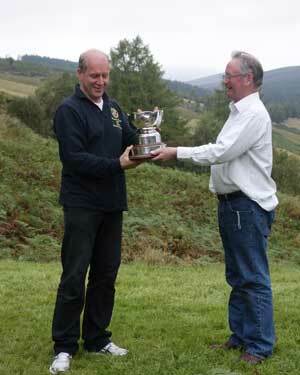 Top scorer on Sunday was Nick Tremlett on 213 with Tim Kidner placed third, one point behind, as high Scot. Overall winner for the week-end was Nick on 426; Jim McAllister was third on 422. Detailed results can be found on englishviii.org.uk. 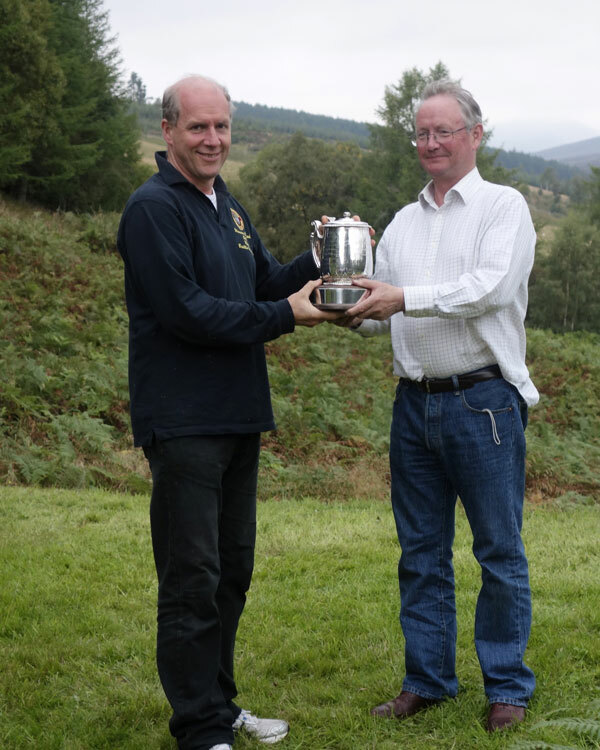 In the event the destinations of our two trophies were unaffected by our decision to discount the unfinished range, but for the record the full corrected results for the Scottish VIII Cup are appended below. The Club is sorry to learn of the death on 15th May of John Murray, 11th Duke of Atholl. John Murray had succeeded to the title on the death of the 10th Duke, George Iain Murray, in 1996. 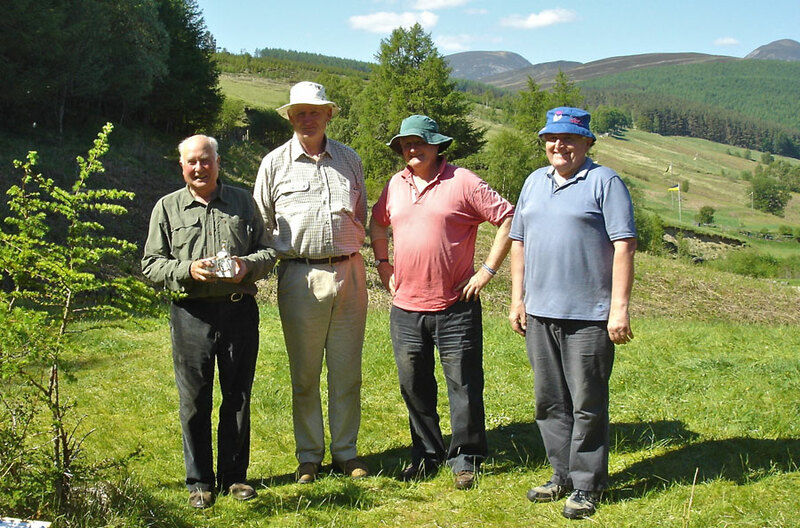 The 10th Duke was closely involved with, and generous to, West Atholl RC. The 11th Duke lived in South Africa but visited Blair Atholl for the annual parade of the Atholl Highlanders: he is succeeded by his son.